Mohammed was 11 in 2013 when an air strike over Damascus destroyed his home, killing his mother and three of his siblings, including his three-month-old baby sister. 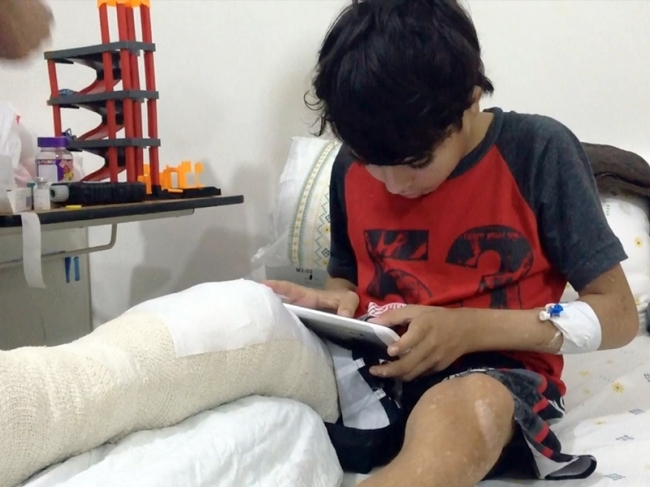 Shrapnel buried itself in his leg, but he and his father fled across the border to Jordan. They have been living in the Zataari camp since then. But Mohammed’s leg is still severely injured. In February, 2014, a Zakat Foundation of America (ZF) team met him and his father, and offered to cover the considerable medical expense of treating his wounded leg. So far Mohammed has undergone four surgeries and ongoing antibiotic treatment to prevent infection. Thanks to ZF donors he and his father are hopeful about his prospects, though his treatment is not complete yet. God willing he will progress to the point where he will be able to have physical therapy and walk again. The road to recovery is steep, but ZF is by his side. Generous ZF donors know that saving one life is the equivalent of saving all of humanity. Without the antibiotics, surgeries and ongoing medical treatment that Mohammed is receiving, his life would be over. Thanks to you, even though his world has been turned upside down, this boy’s life is saved.